However, houses, home organization, decluttering and sorting stuff is one of my favorite pastimes. I’m actually looking forward to the challenge of finding ways to organize toys. That’s ok – I’m still going to make some effort though! I’ve babysat kids enough in my life to know that putting all the toys back in the bins can be fun. (I’m there are TONS of cool options at stores like Homegoods, TJ Maxx, Target and more too! So where will all the STUFF go!? 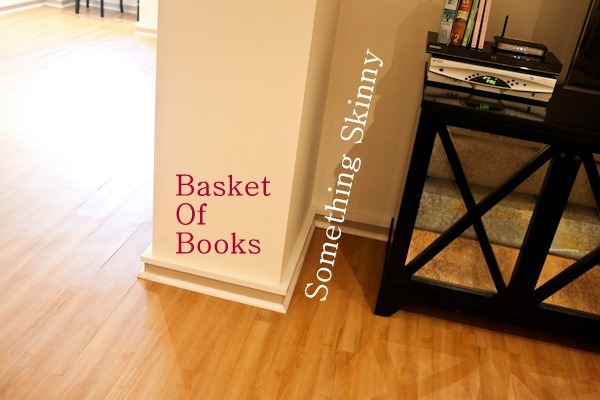 Well I have some ideas….and empty corners….and plans for lots of cute baskets and bins. It’s on the “stuffy” side (haha) because we don’t really use it that much. Mostly for entertaining and reading. 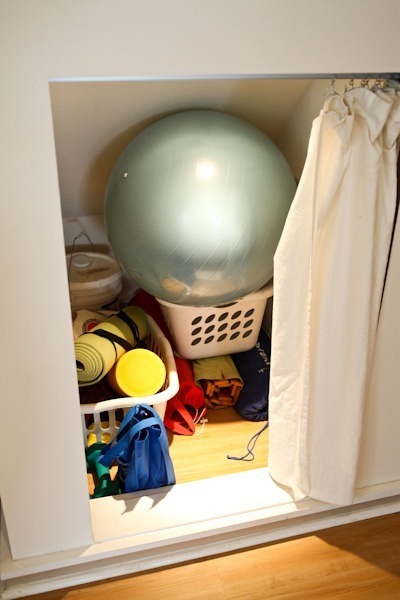 But it’s the closest living space to the kitchen, so I can see it becoming kid play area – although I wouldn’t be able to have my eye on him so safety is a concern. I now understand why all the women on House Hunters want the open kitchen so they can see their kids playing! I know there is a nice open spot for the swing though1 Can you leave your baby out of eye’s reach in a swing? One thing about our living room rug. I absolutely love the texture and feel….until you put a knee on it. It’s probably the worst surface for baby crawling ever!! I hate to get rid of it, but we will see what happens and where we end up doing most of the playing. I imagine our downstairs family room will become Play Central. There is less to break and lots and lots of space for toys, pack n play, swing, etc. It’s just so dark down there! But I realistically see myself spending the most time here both once the baby is born and when he is much older too. Plus the rug is plush! This entire corner is empty! Up in the dining room, we have several corners that would work for the high chair – I’m hoping to get a modern green one to match the green lamp shade! 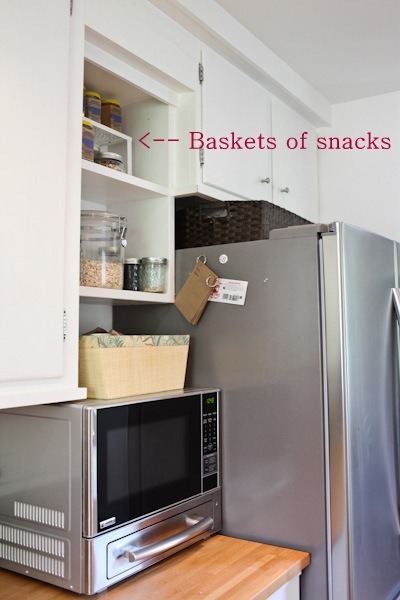 In the kitchen, we have several spots that can be reorganized for baby/toddler bottles, cups and things. 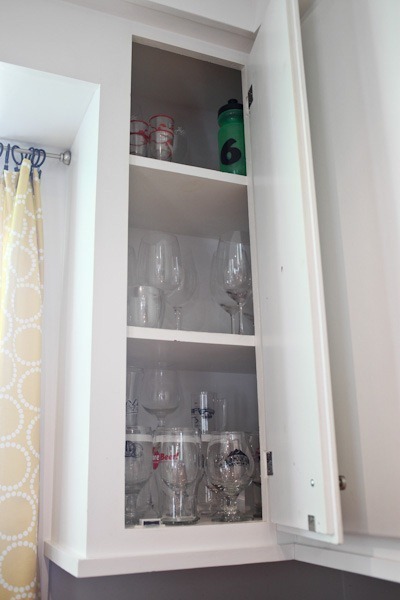 The poor wine glasses really could go elsewhere.. and this could become the bottle cabinet! 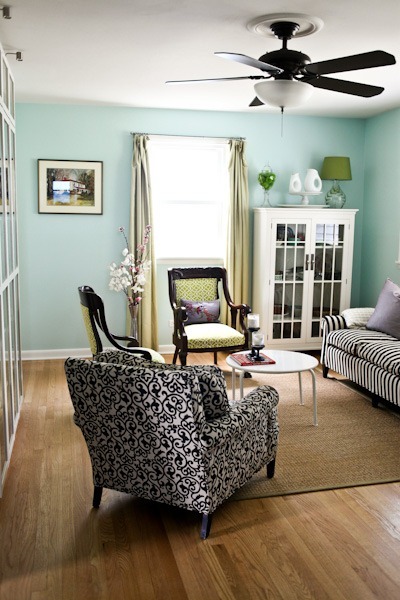 On the different floor areas where you mention scratch rug or no rug, you can always just lay a quilt or blanket down. The baby won’t care and its easy to fold up and put away when you are finished or throw in the wash when it gets drool and spills on it. That is what I do. My rug isn’t scratchy but it is expensive (to me, ha-ha, it’s a Pottery Barn rug) and I didn’t want drool and spit up all over it so I just put a quilt down on it when my babies were smaller. Ikea has a great, inexpensive play mat that is perfect for this. Or a towel- for no nappy time! We do tons of toy storage around the house for our 13 month old. 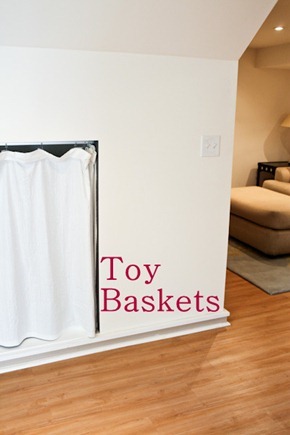 Some thoughts — I don’t think you want to plan to have toy bins tucked away. It sounds counterintuitive but the last thing you want is your baby slamming their face into a chair/table to grab a toy. We have taken away so many pieces of furniture to accommodate play areas (and any thing that is climbable!). I just recently cleaned out 2 kitchen cabinets on the bottom to make it a fun place for my girl to play while I’m cooking. Thankfully baby proofing and furniture rearranging is a gradual progression. I don’t think we started moving things to make way for crawling/pulling up/walking/reaching up/climbing until 8 or 9 months and even now we’re still moving things! Actually, we just mounted our TV on the wall since the baby can now touch it and it felt like it’s only a matter of time before it comes crashing down. Don’t buy everything now — you’ll see what your kid likes to do and where play is best for your family and make that work. I know it goes against nesting but I found things I did when I was pregnant (and useless items I purchased) have gone by the wayside in favor of more practical things. Oh, don’t under estimate hard/firm bins. 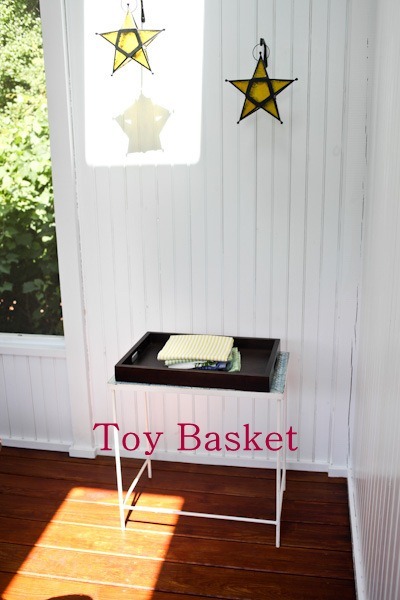 Most kids will stand up at the bin to take out or put in toys. 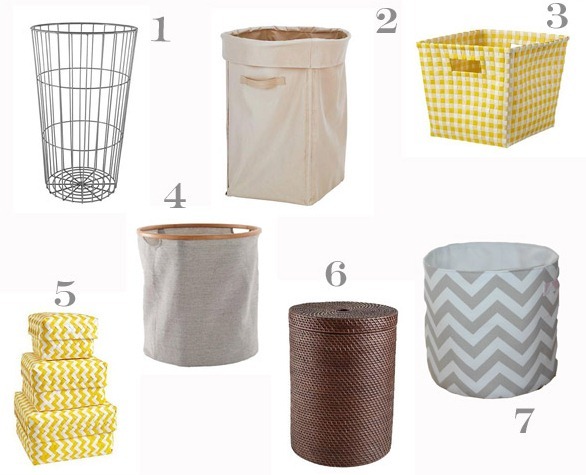 Laundry baskets or storage tubs have been very sturdy for us. I have a few cloth bins with wire around the frame and it just didn’t give tremendous support. Low to the ground and wide is great for holding them up. Anything really tall will get knocked over! Such a great idea to create a play space for your daughter in the kitchen! I was going to suggest something sort of similar, Kath: you might want to keep kids’ plates and cups in a lower cabinet so that when he gets older, he’ll be able to get them himself when he wants a snack or drink. It’s something I’ve wanted to do for 9 years now, but never got around to. As a result, our kids are masters at crawling up onto the counter to get to the cups when they want a drink. Drives my husband crrrazzzy! 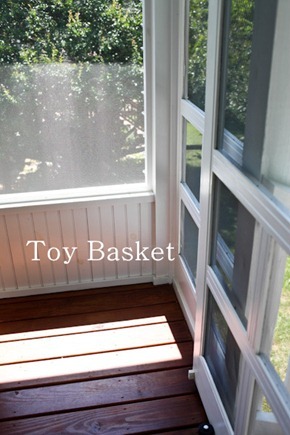 If you’re looking for backyard play options, check out this post from the handmade home! 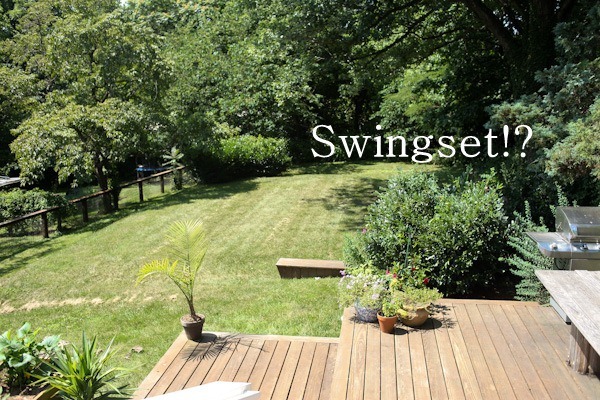 it would look perfect in your backyard! I have such a love hate relationship with storage bins and organizers that are left out in the open. 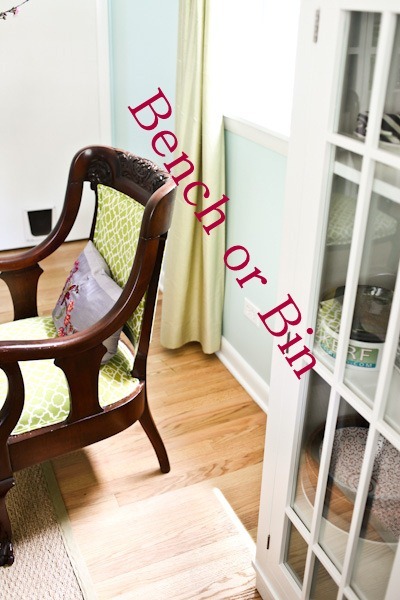 I find they get dusty and dirty and make the task of keeping a clean home even more daunting. Although cute, those bins would probably drive me crazy! Looks like plenty of space for toys and books. I’ll start shopping! 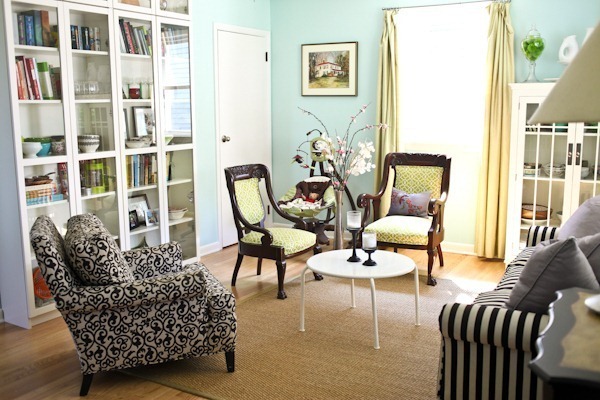 Kath, I have hardwood floors throughout my house with a few throw type rugs in several areas. My grandbaby crawls all over and it doesn’t seem to bother him. It looks like it would be unvomfortable or even downright painful but my daugher insists if it hurt him he wouldn’t be doing it. Bins for toys are great. It’s great to find places low and safe enough to be reached easily. 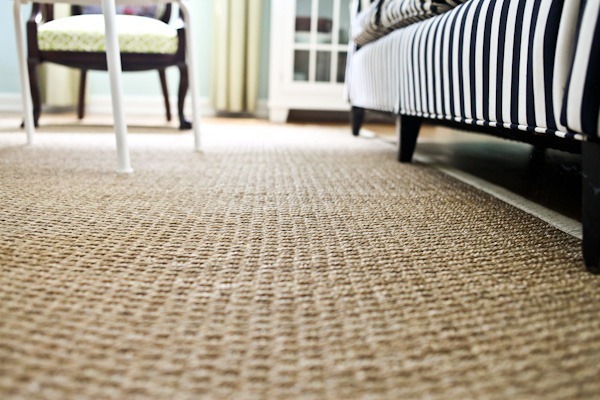 Also, the sisal doesn’t necessarily have to go. One of the best things we had was baby leg warmers so the baby can wear a onsie but you can pull on the warmers for crawling in grass and other not knee friendly surfaces. They actually market these but you can make your own out of socks. Have fun with all the organization. I’m so excited to see your family grow. I feel as though I know you from afar. :o) Please accept this as an open invitation to use me as a quick resource should you have any questions about the growth and development of young (is it wrong I’ve already decided to call him Baker until future notice?) Baby. All the best to you and all yours! And yes, Baker is his family nickname, but not his real name! I am voting for Baker! I can’t tell you how many compliments my son Baker gets about his name!! 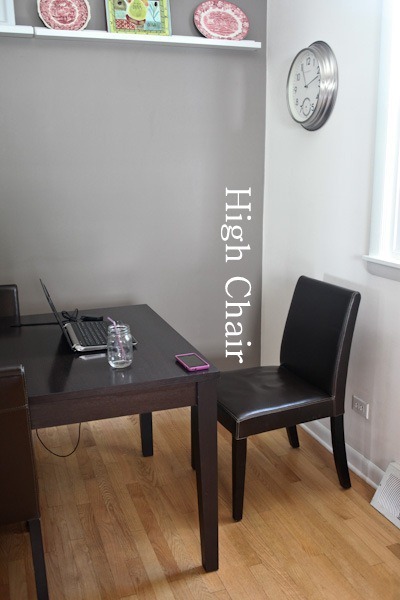 It saves space because you can put it right on a regular chair, and it’s portable, too. We’ve been really happy with ours! We have carpet installed in our apartment and I’ve thought about the possible rug burn thing too. I recently came across this website in a parenting magazine http://www.crawlings.com/products.html for baby knee pad socks? Not sure what they are called but I find them super cute! And in case you ever have company over and don’t feel like laying out a blanket on your floor, I think these would work just find. I think I will purchase a pair or two once baby begins to crawl. Goodness your house is just so gorgeous! I don’t think you’ll need to worry too much about that rug…your little one will be learning to crawl in the winter and likely won’t have bare knees. He’ll be cruising by warm weather and probably walking not too long past this time next year! Smart to wait and see where you actually end up playing! I always said I would never make my dining room a playroom. The day that my son started crawling (literally) I started converting it. It’s so much easier to have a room where they can play and you know they can’t get into too much trouble if you are cooking or doing something for a little bit in the other room. 🙂 And yes…especially at first you can definitely leave the baby in the swing…most likely sleeping. Also, not to be overstepping, but babies are so much simpler than people make them out to be. They don’t need bins and bins of toys…it’s amazing what will keep my kiddo entertained! And he plays independently for longer when he only has one or two things out; any more than that, and he gets overwhelmed. I don’t even have a baby on the way, but this post makes me excited to organize something (anything)! Ha! You will probably love the OXO sprout (with green back) highchair. Heard great things and if I hadn’t gotten a hand-me-down Eddie Bauer chair (which works just fine) I’d have purchased the sprout. Would match and fit well! Also…we have jute and sisal rugs in our house (over hardwood floors) and at the beginning I’d throw quilts or blankets down for tummy time and just playing but as he learned to move more I was surprised how little he cares what the surface feels like under him. His willingness to explore and move is the same at my house (jute, wood) at playgroup (foam mat) at grandparent’s (plush carpet). So…while I planned to get new floor coverings – I never did and now I am glad I waited! Also, re: swing out of sight…my guess is you won’t “want” to. Now that my son is 11 months old, I plop him in the kitchen and hand him measuring spoons/cups and strainers and he plays while I cook. Granted I have to rush and double-task to keep up with his attention span (read: not long) but it works. I used to have my swing (a mini chair actually that was a bouncer) in the kitchen for him to sit as a little baby, when he outgrew that I had him on a blanket in the kitchen with toys then I had a jumperoo for him (which he now is too old for in his opinion) and now he just sits and crawls around on the floor so the stuff is an evolution in my house. I would fold the blanket up each night to neaten the space, but the jumperoo – well – no way to have that out of sight! You look so cute! SO cute. I think your smart to get ready for all the stuff that comes along with a little one. I would offer this food for thought. All those beautiful glass doors on your cabinets are going to be an issue when the little guy starts moving around. I worry that he will want to bang on them with hands or toys and also possibly fall into them as he becomes mobile. The swing looks great in the corner and will work there for awhile. You will want to be able to get to him quickly to replace the pacifier, wipe spit up, soothe the tears etc. It’s a work in progress you will find what works for you and your little boy. So exicted for you and your family as you welcome you little boy. Our entertainment center is glass doors (from ikea) and free a few times of saying no, don’t hit, he learned. Now we even cleared out one side of CDs we don’t listen to and use half for puzzles and books storage and he can help himself. Ah! I am so jealous of all your space!!! But happy for you, too. 🙂 It didn’t really become a problem until after 6 months for us — now that Ada is crawling everywhere and moving around. Before that, we just put stuff away and pulled stuff out and she didn’t play with a whole lot at one time. The downstairs living room looks the cosiest to hang out and play, plus there is a lot of room for baskets, shelves, etc to organize the toys in. 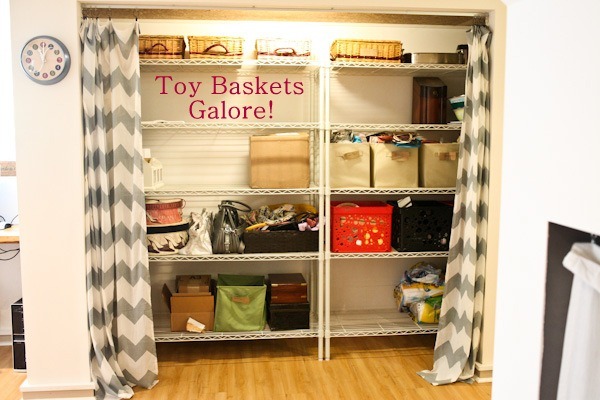 Baskets, bins, whatever are great to have to throw the toys in when you are done. My kids are much more helpful in the clean up process because each ste of toys has it’s own bin. You may like these…http://amysnutritionbynature.com/2012/06/13/35-weeks-and-counting/ Scroll down to the bottom of post to see the chocolate shelves and kid friendly bins that go in them. 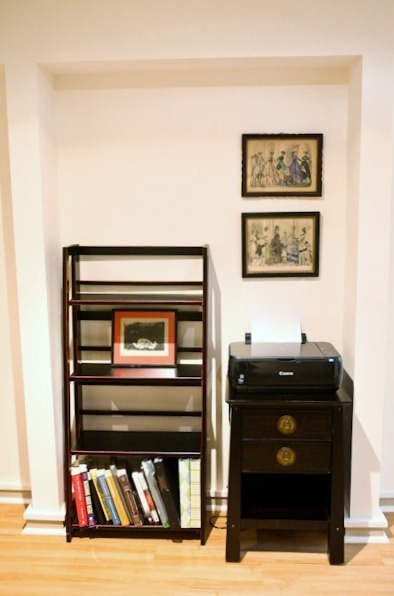 The shelves can be turned up or sideways, they come with a wall mount if you decide to go vertical. They are from Target. The upstairs (i think) living room is beautiful and I would try to keep it the way it is for the time being. I like having something that still looks “adult” in our house, even with 3 kids and a baby on the way! It leaves one space that is still nice for adult entertaining. Yours is very pretty and nicely decorated. Have fun with the organizing, it is fun! It will all just “come together” with where to put toys and snacks, and this’es and that’s, as baby grows, and you all find your flow. And bonus to you if you can keep it all IN the baskets 🙂 Honestly though, we tried to keep our daughters toys and stuff mostly in her room when she was younger since we have a small urban pad, toys everywhere would have taken over our house! i love all of your organization ideas. i would love an update when you all are actually in full swing with baby & toys. when that time hits for me, my goal is to not let the toys take over my house! i don’t mind it looking like children live here, but i would like to keep it somewhat organized & neat, if possible! i think baskets & bins are lifesavers. You might also want to get a nice toy chest that has a lid for more your more formal areas. We have a wooden one in our living room, and when the lid is closed, it just looks like a pretty bench/chest. But make sure it made to be a toy chest and has the type of lid that doesn’t slam shut. Hey Diane! I would love to see a link to yours or something similar. Where is yours from? I have a five month old and am looking for something exactly like that! I so appreciate it! by the way.. cute belly!!! We think (planners-organizers) alike!! 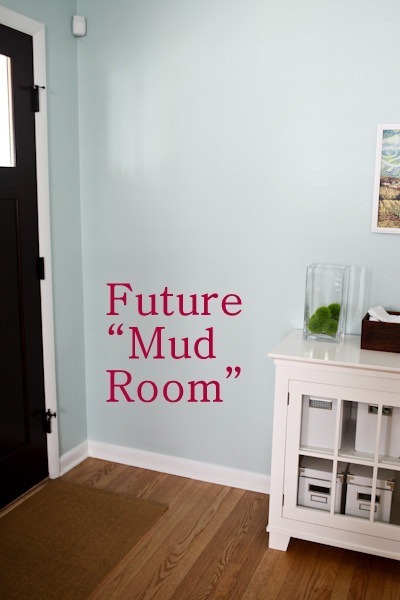 I can’t think of any retailer that captures my style more than C+B and their Land of Nod, for the kiddos! And, I never tire of any of the furnishings and accessories I’ve bought there. You got great plans, Kath! The baby might need knee pads on with the hardwood floors in the house, and carpet in the living room 🙂 However, some whole house carpets are hard on babies’ bare knees, because of some of the different textures of carpets. I don’t think it’s too early to think about where the toys will go, especially if the thought of clutter brings on anxiety. 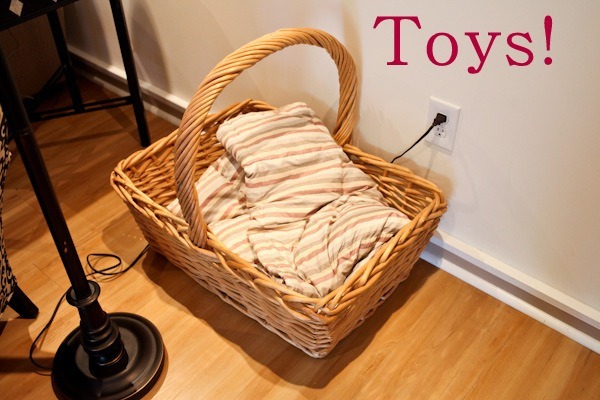 Having a place in every room to put the toys away will minimize the clutter in each room instead of one looking like a toy explosion. I’m not so good with this, but my mom kept a big basket in the living room where we kept our toys for downstairs to play with and we never had a problem putting them away…of course that reponsibility came when we were a little older, but it wasn’t a new concept by the time we reached the age where we could put the toys away by ourselves. So, my mom was happy that she had a clean living room and my sister and I learned to put things away and got to play wherever we wanted. It also taught us to take care of our stuff. My baby is 1.5, and although people think I’m crazy, I ABSOLUTELY pick up his toys before naps, meals, and bedtimes. 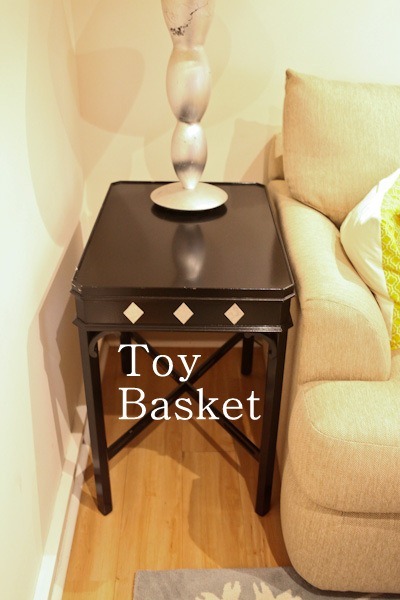 Everything is in a basket or some storage (we have 2 ottomans that have storage). I couldn’t do it; leaving his toys out drives me insane. And he loves all of tiny, annoying cars! I’d never deprive him of those toys, which are great for him, and as long as I’m ok with his storage bins and baskets been unorganized, at least they are out of the way of us – and out of range for dogs, who love to chew his wood puzzles! Hi! 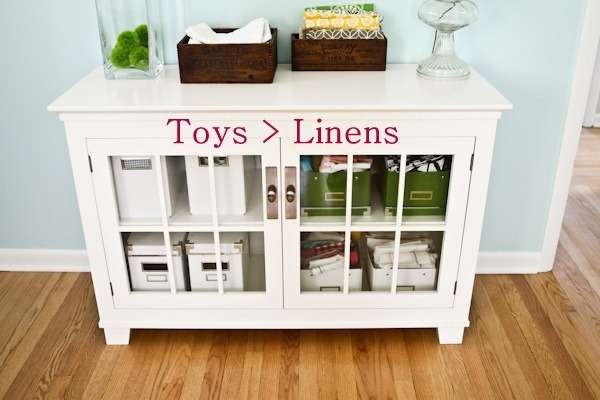 Where’d you get that great cabinet (white with glass front) that’s labelled Toys> Linens? I’ve been looking for a piece that looks like that! It’s never to early to think ahead! 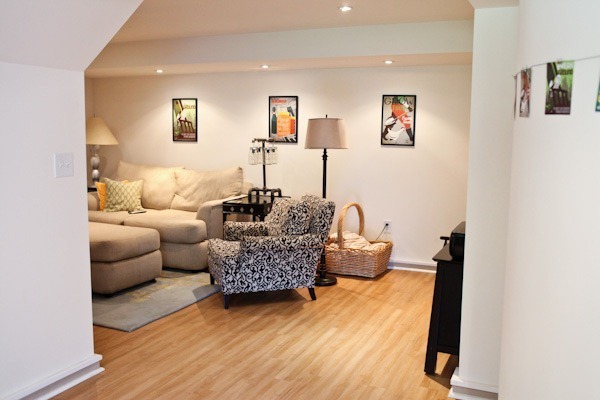 The downstairs space looks so cozy, I’m sure he’ll be utilizing that a lot when he gets a little older! love all the storage ideas! That way you wont have toys laying everywhere. We turned our formal dining room into a playroom so ALL the toys stay in there. No toys in bedrooms or living room and i dont mind if its a little messier either since its their room. 2. For the cabinets with glass – they make all types of gates to put in front of things like entertainment centers, etc. Making a whole room off limits isn’t practical (unless you really don’t need that room & can shut a door or put a gate in the doorway). 3. Outlet covers, little fingers fit perfectly. 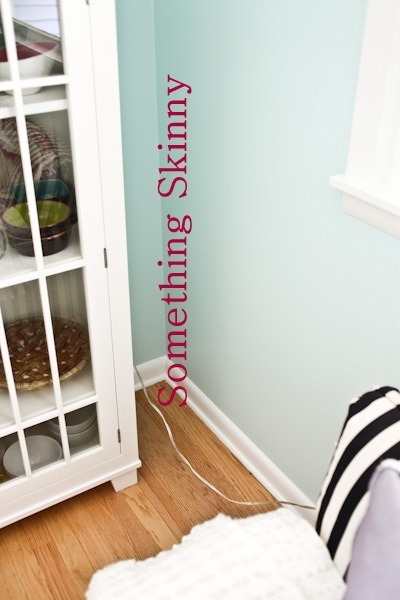 And think about how best to handle floor lamps and cords of all types (for sleepy parents not to trip over as well as crawling/scooting babies to grab). My daughter loves to play with the storage bins for her toys just as much as she loves to play with her toys. She often takes all the toys out of a bin and sits inside:) I love putting all the toys away after we put her to bed and enjoying a toy free living room! I personally wouldn’t worry about getting a rug for the porch, because once little one starts to crawl, he might not want to stay on it. 😉 My son just started crawling and our soft, rubbery alphabet playmat is now useless (probably until he becomes interested in the actual alphabet…). I agree with previous posters that before baby is mobile, a soft blanket works well (and a towel on top for naked bum time…). I am so obsessed right now with organizing everything. I now have an addiction to 31 bags/totes. LOL I’m right behind you week wise so I don’t think you are crazy for thinking about this stuff now. Some baby gear is just huge and there is not a lot you can do with but for the smaller stuff- bins are the way to go. Plus if the baby grows up with the idea of the storage containers he’ll be more likely to put stuff away later on.